“Market” quickly turns WordPress (a free content management system) into an easy to use, fully functional ecommerce store. 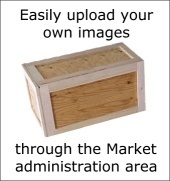 Market helps takes the “technical” out of setting up and operating your own online store. In some of the categories, you may see additional subcategories. Market allows you to categorize products as deep as you desire. Next, click on a few other product thumbnails. You’ll see how you have the ability to add up to 4 images per product. You will also see how some product options allow for additional charges, or discounts based on the option. Go ahead and add a few items to your Shopping Cart by clicking the “Add to Cart” button to see how that system works. Then, go ahead and browse some of the regular text posts by clicking on some links under “More Information” in the left margin. Each excerpt headline is clickable to get to the entire post. Please note: Since this is a public demo, some administrative functionality is limited. (eg. a “demo” user cannot delete all items, edit some posts, change online demo files, etc.) This is so people cannot go crazy and break or erase this online demo. When you operate your own copy of Market, you will have ALL administrative privileges and rights, and will be able to modify all of this and more. Hopefully by now, you’ve had the chance to play around with the frontend of Market, so let’s explore the management features of the backend administration area. Once there, go ahead and a product. To do this, click the “Add Product” link under the “Market Theme” menu tab, and enter a test product of your own. You’ll want to fill out at least the top couple of boxes. The other fields on the page are optional, so just fill in what you want to see in your example. After you’ve entered your product information and chosen a category, click the blue “Publish” button. To see your new test post, go back to the online store demo in your other browser window and click your “Refresh” button. You should see the product show up at the bottom of the Home page in the “New Products” section. You can also navigate to the category you placed your test product in. One of the great things about the Market theme that distinguishes it from many of the other typical ecommerce solutions out there, is that it still allows you to operate a blog with ongoing content. Managing your products through the Market Product Manager menus are very easy and intuitive. Another great feature of Market, is the ability to create a “Grid-view” page that displays all of your products in grid format. This way, you can present all of your products in a straight-forward visual manner, allowing your visitor to quickly browse all of your offerings. If you haven’t already, click on the menu item above in the navigation area labeled “Grid-view Template” to see this in action. Although we think Market is a great looking theme as it is, you’ll be happy to know that the look of Market is fully customizable. You can use the theme as it is “straight out of the box”, or customize it to your heart’s content to make it uniquely yours. In fact, through the Market Theme settings area, you can choose from over 20 built-in color schemes with a few simple clicks. With so many good ones to choose from, you’re sure to find one that fits your style. If that’s not enough already, most of the coloring and formatting is controlled from other options in the “settings” area, or directly through the stylesheet file. The Market Theme is also fully “widget” ready. Regular text posts will display under the “More Information” section of your website sidebar margin. Now that you’ve seen the Market demo in action, why not download a copy and setup your own online store right now? Go ahead and click on over to the Market Theme website for more information and how to download a copy.